Modernizing the Senate is an important concept to ensure our august Chamber continues to work towards maintaining the confidence of those we represent – the people of Canada, writes Senator Mary Jane McCallum. This piece by Senator Mary Jane McCallum, an independent Senator representing Manitoba, was originally published in the Hill Times on June 11, 2018. The move towards modernizing the Senate is an ongoing endeavour that will not happen overnight. While this process will come with its share of growing pains, I truly believe that the end product will be in the best interest of Canadians. As part of this shift towards modernization, it is my belief that the Senate would be best served by operating as an independently-minded body rather than a de facto second House of Commons where members are expected to toe their respective party line. 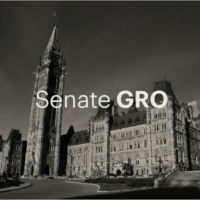 I have found recent remarks from my Conservative Senate colleagues regarding the notion of Senate modernization to be disappointing and injurious, as it seems some feel that the Independent Senators Group (ISG) – and the Senators that comprise it – somehow lack autonomy as well as an equal level of legitimacy. During debate in the Senate, one of my Conservative colleagues recently made the remark that Senators appointed as independents by Prime Minister Trudeau are now, “being told by the same Prime Minister that [our] independence has limits.” I feel it is important in light of these comments to unequivocally assert that my independence has no limitations. I have not been told, instructed, or directed on how to vote on any issue before the Senate or Committee and enjoy the freedom and independence as a non-partisan Senator to approach each topic before the Senate with an open mind. I vote based on the evidence and knowledge I garner through my own research and the deliberations of the Senate Chamber and Committee. I find this particularly disheartening as it paints individuals appointed from non-political backgrounds and somehow inept or incapable of adequately performing their senatorial duties. The beautiful reality of the Senate is that it is an institution that celebrates and values individuals from eclectic backgrounds. It is these wide-ranging points of view that facilitate a more well-rounded and fulsome debate while also bringing a vast amount of perspective to countless issues. Having Senators appointed to the Upper Chamber who do not have previous political experience should be welcomed and lauded and not simply discredited. An argument can even be made that Senators who come from these non-political backgrounds are more in-touch with the average Canadian. These individuals – myself included – have not “had our heads in the sand,” but have rather been gaining a lifetime of unique experience and expertise to bring to the floor of the Senate upon our appointment. This same former colleague also classified the Senate as “like a think tank.” I wholeheartedly agree on this point. Yet, it is important to note that think tanks perform better when many different perspectives and points of view are brought forth for discussion, debate and consideration. As one of the main functions of the Senate is to act as a sober second thought on legislation that comes before us, it is incumbent on Senators that they have the ability to approach any specific matter with an open mind so as to act – and vote – in a manner that is best for Canadians. I can proudly say that, as an independent Senator, I have enjoyed this freedom since my appointment. Modernizing the Senate is an important concept to ensure our august Chamber continues to work towards maintaining the confidence of those we represent – the people of Canada. I, for one, look forward to continuing this effort in my role as a non-partisan, independent Senator.